Product #60741 | SKU ES-T26-AB | 0.0 (no ratings yet) Thanks for your rating! Arm your camera with this Tilta Camera Cage with Gold Mount Battery Plate specifically designed for the Canon C200. The optional Tilta Battery Plate for Canon C200 Cage attaches to the top plate via an Arri Standard Rosette connection (the top plate and battery plate come as a package if you order the version of the cage with a battery plate; if ordered without a battery plate, the top plate is not included). It provides an alternative way to power the camera and has several different DC and P-tap outputs to allow you to power accessories. 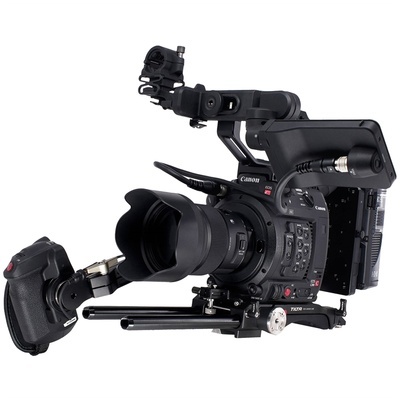 The optional top handle fits snugly onto the top plate and allows you to attach the Canon C200 LCD monitor as well as a shotgun mic bracket (the top plate is not required to attach the handle; it can also attach directly to the top of the Canon C200 body). It also has several 1/4″-20 and 3/8″-16 screw holes to allow you to attach accessories and is made from the same sturdy aluminium-alloy material as the rest of the cage.